April 26, 2018 Robert W.
A main reason why Las Vegas is the “Trade Show Capital of the World” is that not only do we have lots of space to hold events and shows, but because of all the amenities that Las Vegas offers there visitors and guests. Not only is there gambling, fine dining, golf, luxurious accommodations, there is so much fun to be had in Vegas. When people are not at the trade shows, they can relax and have fun in their off time. Las Vegas custom trade show signs can be made locally and sent to your event for set up at very good pricing. many sign companies offer assistance in set up or the event venues themselves have personnel available to assist you. Ed Brown of Posterhead Signs, who can be found at ( https://orcid.org/0000-0002-6447-1763 ) can assist you in locating the right sign company for you and help you find the right set up personnel for your event. The local area has state of the art sign companies that can do most projects at very low pricing. In addition, many banner stands, signs and banners can be printed and made the same day. Delivery to your event site can be arranged in most cases to make your trade show experience stresss free. 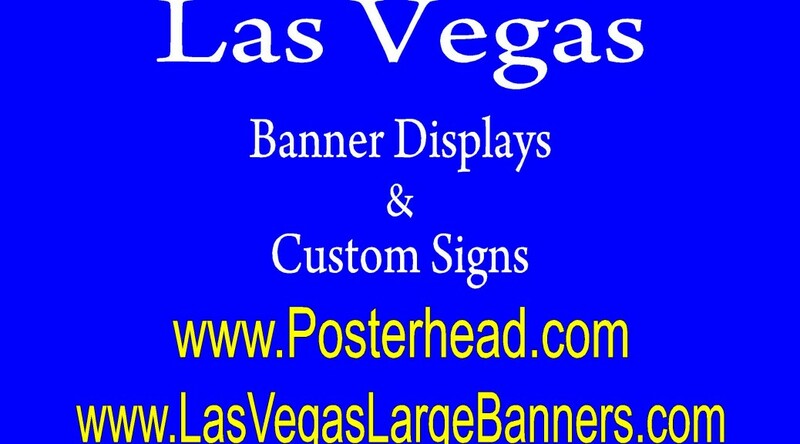 April 25, 2018 Robert W.
Custom vinyl banner signs in Las Vegas can get you a custom printed banner for your business so you can advertise and ” Get More Business” ! In the tough Las Vegas business environment, every business is needing more business and smart businesses are learning that old fashion ” On The Premises” advertising is a very cost effective way to promote your business and products. 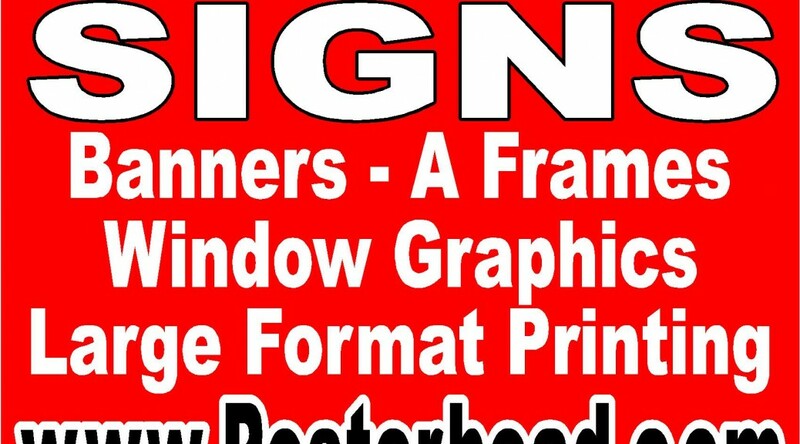 Las Vegas area businesses are placing custom vinyl banner signs on there storefronts ,fences and other places so that they can be seen by the auto traffic driving by. The average city street of Las Vegas the size of Spring Mountain or Sahara Ave literally has tens of thousands of vehicles drive on those streets everyday. 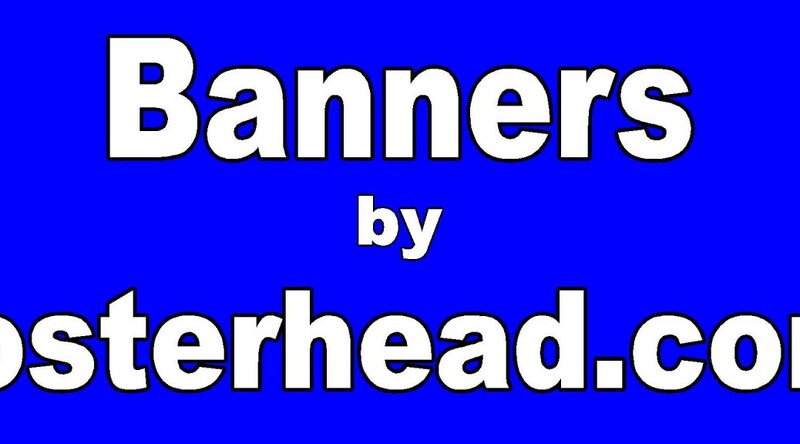 Stores are placing custom printed banners advertising their products or services on these banners and getting noticed. The return on investment is spectacular and the stores are getting a lot more business and revenue. Large companies that are located adjacent to the freeways are placing even bigger banners on their buildings so that they can be seen from the freeways and get even more attention from the thousands of vehicles that drive by on the freeways each and every day. These companies are placing large 8ft tall banners by 30 feet long advertising furniture sales, a/c service and a host of other goods and services. Since the banner is a one time cost of about $1.50 a square foot ( full color banner with grommets), these banners act as sort of a large billboard but without the monthly rental fees. These banners last well over a year and some smart companies are even rotating their banners monthly so as to draw more attention to their businesses. Custom vinyl banner signs cab be purchased at sign companies all throughout the Las Vegas area. See how these large banners can help you and your business. April 24, 2018 Robert W.
In fact, there is a multitude of sign companies in Las Vegas that are willing and able to assist you in getting your signs and banners made professionally. Las Vegas has many professional sign companies that have the newest and best technology to make your signs inexpensive and with more quality than other cities. That is because there are so many events and shows in Las Vegas requiring signage that only the best sign shops can survive among the fierce competition. People coming into Las Vegas for events and shows spend thousands of dollars on their booths and only want the best signage for their customers to view. And do the events and shows come to Las Vegas because of the 24 hour party atmosphere that allows people to do business during the day and enjoy themselves at night with all the entertainment, fine dining and other fun experiences. Also, many people bring their families to these shows and events because when they are working, the family gets to use the waterparks, theatres, arcades, pools and other activities centered around family fun. Las Vegas event signs and banners include banner stands, vinyl banners, coroplast signs, foam board signs and many other types of signs found at the events and shows. Many people like to have their signs and banners made in Las Vegas and picked up in Vegas for a “no hassle” experience as signs have a habit of getting damaged while being shipped or being shipped to the wrong location. April 23, 2018 Robert W.
Pop up banners are inexpensive and a very effective form of signage at events and shows. These pop up banners can be placed anywhere because they stand alone and come in a multitude of sizes to display your products and services. They are easily set up and can be travelled with without inconvenience. Everybody loves to come to Las Vegas because it is a fun and exciting place to come. Not only do we have gambling, 24 hour night life, top rated restaurants and entertainment Las Vegas has become a family oriented city where you can bring your family along while you attend or display at the events and shows. 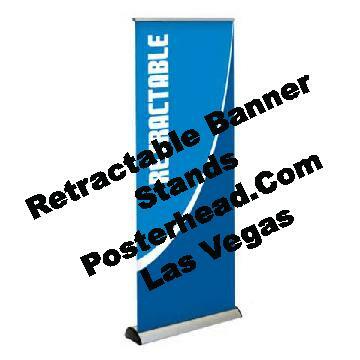 Vegas pop up retractable banner stands are a necessity for the trade show and convention industry. Vegas pop up retractable banner stands can be seen at all the event shows at the Las Vegas Convention Center, Mandalay Bay Convention Center and Sands Expo Center venues. Vendors love these types of easy to set up display graphics because they allow for large graphics from a compact case. The vendors love coming to Las Vegas because the events and shows are always well populated. People like Las Vegas because of all the fun and hospitalities that Las Vegas has to offer the people attending the shows. Not only do we have year round outdoor activities like golfing, boating and cycling, Las Vegas is known for its 24 hour party atmosphere for the time when the shows are not taking place. Add in top restaurants and spectacular hotel accommodations, its no wonder everybody wants to have their event here. The most popular pop up banner size is the 33″ wide model that stand close to 6 1/2 feet tall when fully extended. The adjustable pole in the back that holds the banner graphic up is adjustable which allows for different heights. These pop up banners come in a multitude of sizes from 24″ wide to about 5 feet wide with varying heights to accommodate most needs. All the pop up stands come with a carrying case for easy transportation to and from the shows. These pop up banner stands can be set up in a minute or less. Most of the sign companies offer some form of delivery service as well to make it easy for vendors coming into town. Vegas pop up retractable banner stands are available for the many events and shows in Las Vegas at various sign companies in the Las Vegas area are great prices. April 22, 2018 Robert W.
Las Vegas construction signage is needed at construction sites all throughout the Las Vegas area at reasonable prices. Sign companies like http://www.Posterhead.com are examples of sign companies that can make those needed construction signs for safety and liability. The owner, Ed has a strong reputation on the area for making quality signs at affordable prices. He can be found at https://issuu.com/edb51. Construction signage can be temporary or permanent signage. If only a sign will be used for a week or two, it makes no sense it make it with MDO board or aluminum. Coroplast signage works well in these situations and at a lot lower price. If more of a permanent sign is needed, aluminum or MDO board is the perfect choice for your sign needs,. These signs will last a long time in the outdoor weather and can withstand many months of the hot Las Vegas sun. These signs can be made quickly in just a few days. Some of the more popular aluminum signs are the dust control signs that are required by law, no trespassing signs that will keep people out and reduce your liability and perhaps the best of all, the name of your company on a nice aluminum sign so that it can be seen by all the people passing by that you are working on the site. These self promotion signs are very important as it gets your name out into the public view. Many contractors get many referrals when their name and company information is seen on a job that you are working on. Construction signage can be found at the multitude of sign companies in the Las Vegas area. by using Yelp or Google, you can get the information about the sign company of your choosing to make sure you picked the right company. April 18, 2018 Robert W.
Roll up retractable banner stands are effective, inexpensive display graphics that are used at business meetings and in the retail stores in Las Vegas. These compact stands when expanded are perfect for limited spaced areas and can act as a stand alone display. Roll up retractable banner stands are inexpensive and many start off at less than one hundred dollars. ( That price comes with a stand-graphic and carrying case) In fact, the most popular size roll up banner stand is the 33″ wide model that has a height of about 6 1/2 feet and sells for less than $100.00. This stand includes the adjustable pole for height adjustment so that you can get just the right look for your stand. many inferior banner stands require a bleed, but not these stands because of the adjustable height pole. 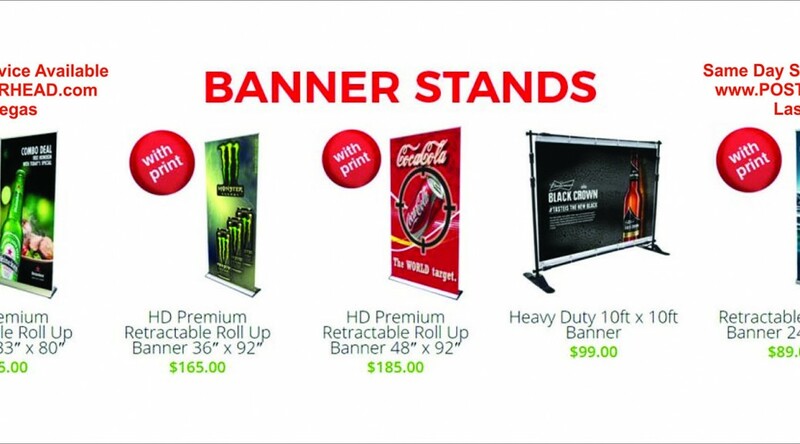 These banner stands come in a lot of different sizes from the small 24″ wide model to the big 57″ wide model. In addition, these roll up retractable banner stands can be purchased in the economy and luxury models depending on your preference. Roll up retractable banner stands are also popular at the multitude of events and shows that happen in Las Vegas. Every year, thousands of events and shows occur in Las Vegas that bring millions of visitors to these events. In fact, many sign companies dedicate their business to these events because of how large the event and show industry is and have logistically placed their business locations adjacent to the Las Vegas Strip so that they can be close to all the events. This helps cutting down time for the customer in getting the graphics to them in cases of emergency. Yelp ( www.Yelp.com ) or Google Maps ( https://www.google.com/maps) is a great place to check the reputation of sign companies in Las Vegas to make sure you get the best sign company for you.